There are many memorable scenes in the film The Wizard of Oz. In one, Dorothy and her companions return to Oz after melting the Wicked Witch of the West, and demand their promised reward from the Wizard. The Wizard refuses until Dorothy’s dog Toto pulls aside a curtain and exposes him as nothing more than an ordinary man. Behind the scenes of every show, there are ordinary folks making the magic happen. 2015 has been a big year for CAMP Rehoboth, and our 25th Anniversary has been, and will continue to be, celebrated all year long. That celebration will culminate in our Silverbration Celebration Weekend in October, which includes the Silver Gala at Nassau Valley Vineyards and the Silver Block Party on Baltimore Avenue. This Labor Day weekend, when the doors open on the 28th Sundance (we celebrated its silver anniversary three years ago! ), it too will give a nod to CAMP Rehoboth’s Silver Anniversary with its “glittering” theme: The Super Magic Rainbow Glitter Ball. Without a whole lot of people working behind the scenes to make the “magic” happen, neither CAMP Rehoboth nor Sundance could ever have survived for so many years. For much of 2015, I’ve kept some 1991 and 1992 archive copies of Letters from CAMP Rehoboth beside my desk in the CAMP Rehoboth Community Center—just to inspire me as we celebrate our 25th! We didn’t start archiving issues online until 1997, so those first six volumes of Letters are rare indeed. I will confess here, that despite whispers of hoarding, by some of my dear loved ones, I have archived (they call it something else) a small stack of every single issue in our attic. Looking back at Volume 1, Issue 7 of Letters (which was, by the way, only eight pages long), there is a feature titled SunDance ’91 Rainbow in the Sun written by Jim Bahr. The article went on to quote Steve [Elkins] and me, as well as our dear friend and Sundance co-host John Van Meter who died from AIDS in the mid-‘90s. All three of us were explaining our selection of CAMP Rehoboth as a beneficiary. Until that point, Sundance had raised funds only for AIDS related organizations: Whitman-Walker Clinic in DC, HERO in Baltimore, and The Names Project. Digging around in the history of Sundance and CAMP Rehoboth opens floodgates of “behind the scenes” memories that make me appreciate more than ever our refusal to give up on something that we believed was worth doing. Even after two and half decades, CAMP Rehoboth and Sundance supporters still make possible the things we argued for so passionately in the beginning. Back then, some even called us radical, though I always disagreed with that definition because our greatest success in the early years of CAMP Rehoboth was finding a balance between gay culture and the mainstream world around us. That balance point allowed us to build bridges to organizations and people all over the state—without losing our own identity. From those early years to the present day, the people of our community have given their time, their talents, their passions, and their finances to support CAMP Rehoboth and Sundance. 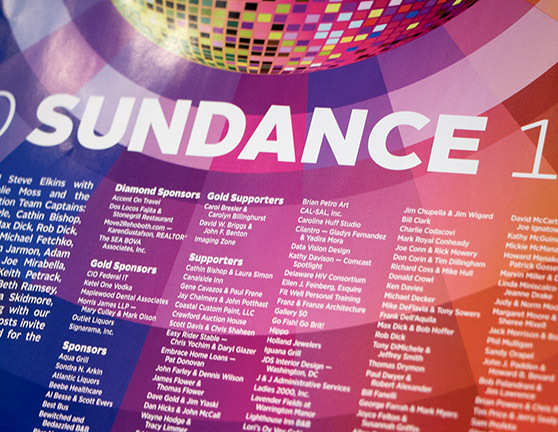 We have only to compare the Sundance 2015 numbers from the quotes above: over 450 individuals on the host list (more than 50 of them logo Sponsors); and since the recession, we generally clear somewhere in the $150,000 range. Sundance makes a huge difference to CAMP Rehoboth—as it has for 25 years. This year’s Sundance theme and CAMP Rehoboth Anniversary are all about the glitter—the sparkle and shine that comes from celebrating the success of both. Once the parties are over, of course, we will sweep all that glitter into piles and go back to the day-to-day work of creating a more positive world. As always, hundreds of volunteers, members, donors, and sponsors will continue to make the programs and activities of CAMP Rehoboth possible. Since 1991, Sundance has been “the rainbow party,” and the theme from that year has summed up the event: Rainbow in the Sun. A rainbow is formed when the sun meets water in the clouds. Rehoboth is also built on that magic place where sun and water meet. Though we are all no more a wizard then the one who lived in Oz, the strength that comes from our ordinary efforts when we come together as a community is legendary. Look for me on the dance floor at Sundance 2015—and please join us all as we celebrate our Silver Anniversary with a whole lot of glitter! Murray Archibald, CAMP Co-founder and President of the Board of Directors of CAMP Rehoboth, is an artist in Rehoboth Beach. Email Murray. 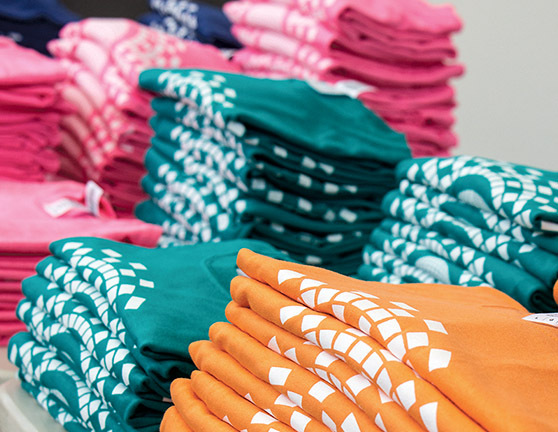 Photos: SD poster and t-shirts.